Let’s make a difference through music! 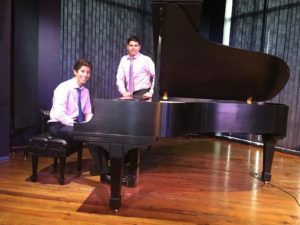 Join high school students Omar and Ziad Fehmi, along with several of their peers, for a very special piano concert benefitting UNICEF’s programs for refugee children. UNICEF has been on the ground since the conflict began, providing children with lifesaving supplies in health, water, and nutrition— as well as supporting child protection and education programs. We hope to see you there to support this noble cause, led by local youth! The event will begin with a powerful video created by Ziad Fehmi, followed by stupendous performances by young musicians. Your ticket purchase and further donations will be fully tax-deductible. There will be no printed tickets and you will check in with your name at the door. If you or your company would like to sponsor the Piano Keys for Syrian Kids event, please do so using the form below. If you are unable to attend the event, but would like to donate, please click here. If you would like to pay by check, please make it out to “CAAP,” with “Piano Keys” in the memo and send to this address: CAAP, 2651 Saulino Ct., Dearborn, MI 48120.